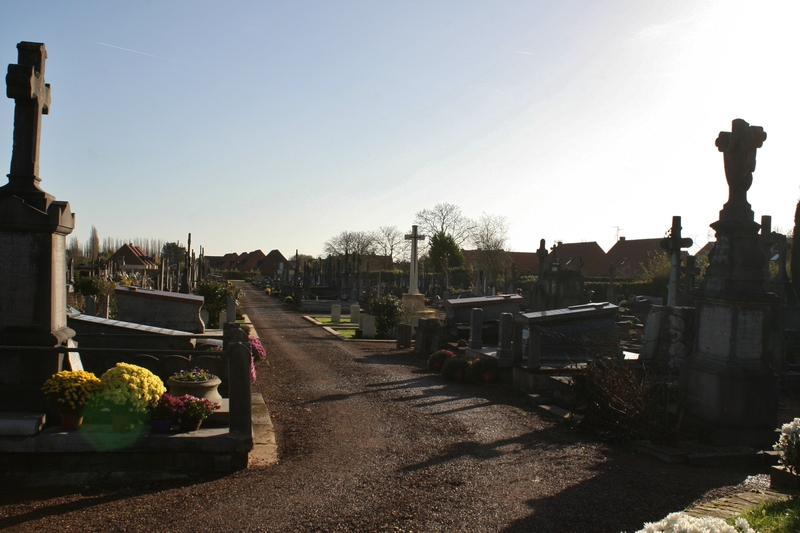 A short distance north west of Pont-de-Nieppe, we arrive in the town of Nieppe itself. 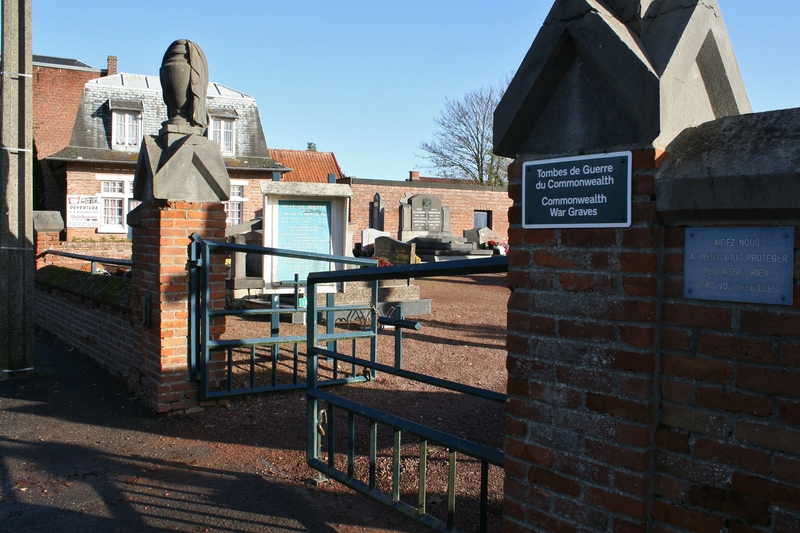 …and if you’re ever touring the Western Front, it’s well worth keeping an eye open for the green CWGC signs that often adorn the entrances to these burial grounds. 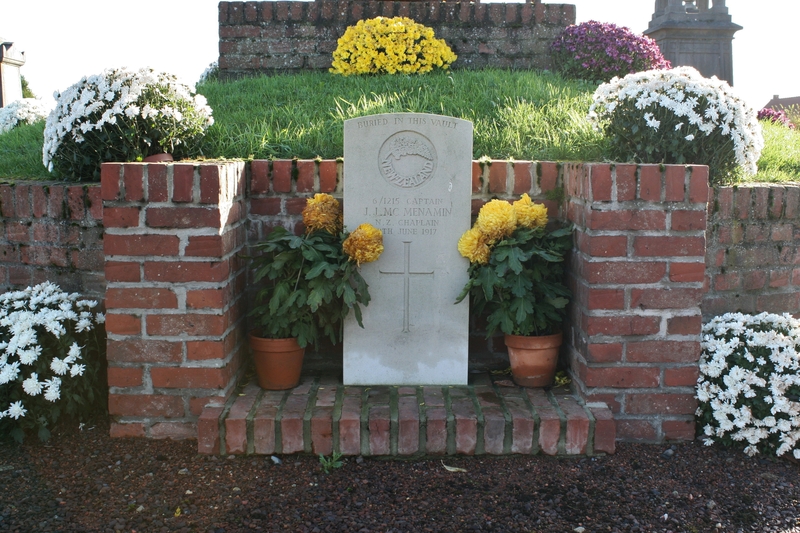 Although the majority of the British World War One burials are in a plot in the eastern half of the cemetery, some are to be found elsewhere, including the grave of Private Charles Marvin Hurst, Highland Light Infantry, just inside the cemetery entrance, but we shall visit him as we leave, for reason that are entirely personal. And no, no family connections, or anything like that. 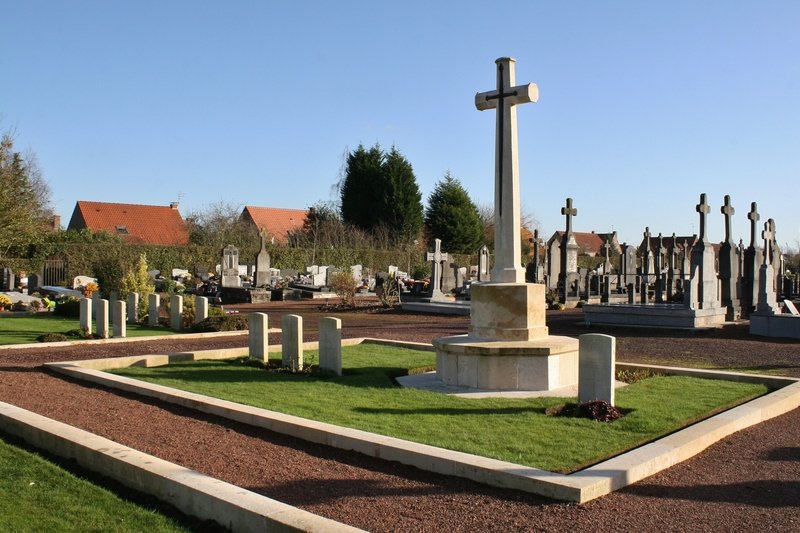 …but this time with a single CWGC headstone inlaid into the brick surround, one of two men buried here who are, unusually, mentioned by name on the cemetery plan (thanks as ever to the CWGC), as neither have been given Grave Reference Numbers. 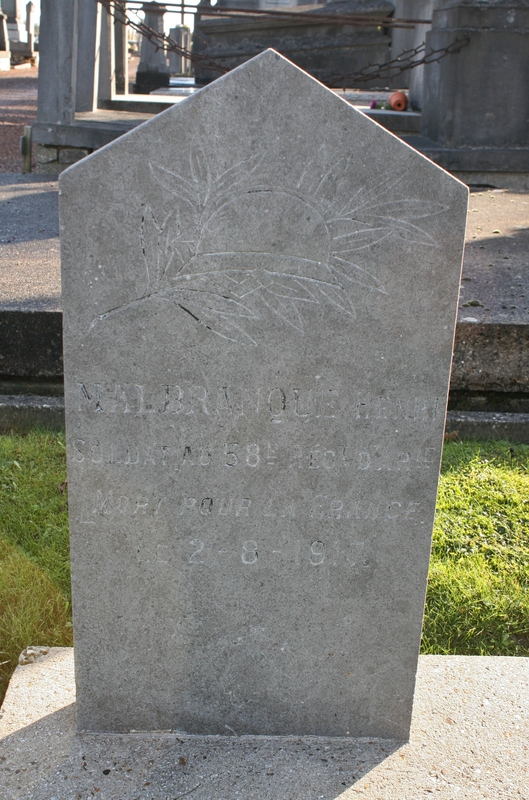 It’s an unusual headstone, as I have never ever seen ‘Buried in this Vault’ on a headstone in all my travels, and I wonder whether this one is unique. 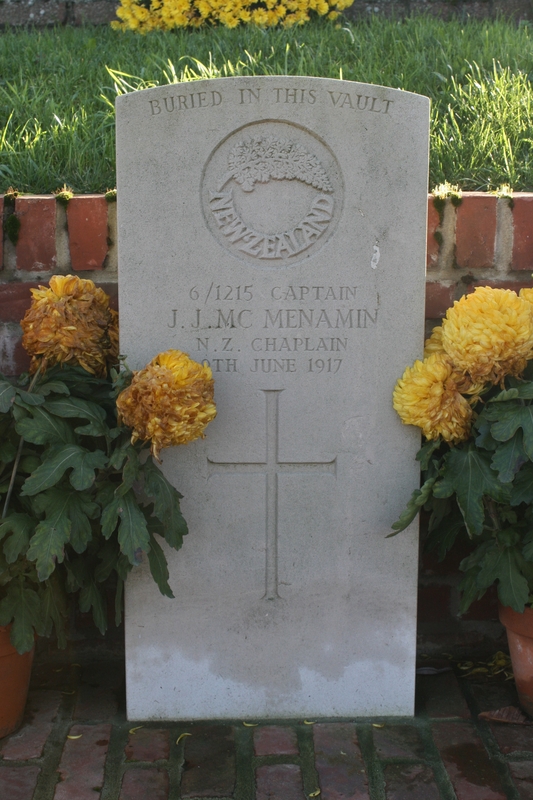 The story behind the death of New Zealand Captain Chaplain James Joseph McMenamin is not an unusual one. 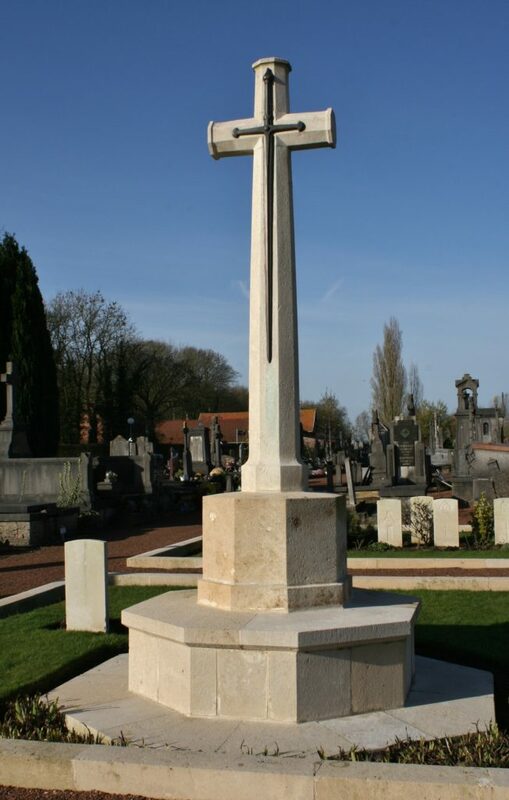 Called to recite the final commendation at the burial of a catholic soldier somewhere near Messines, a German shell found its mark and he was killed. 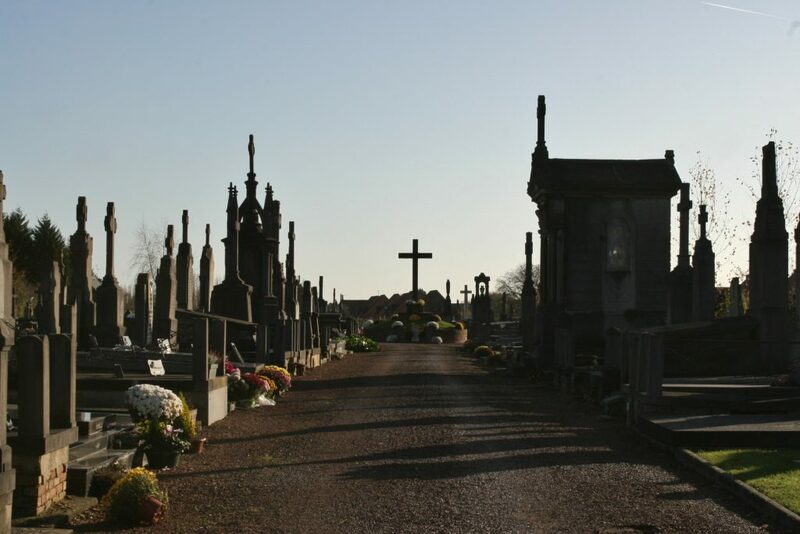 Held in high esteem by the men he ministered, he was brought back to Nieppe for a proper funeral, the local mayor allowing his body to be placed in the priests’ vault, where he stays to this day. 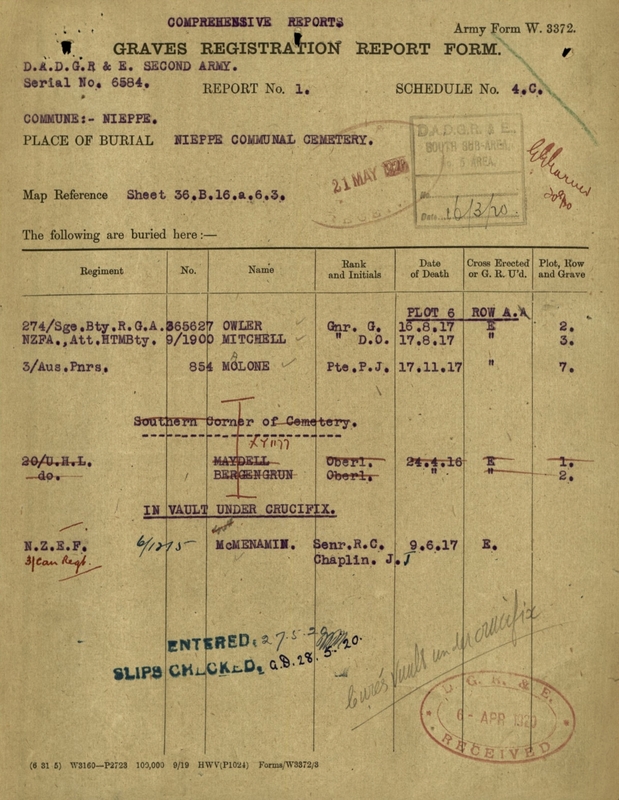 Note the ‘Curés vault under crucifix’ written in pencil on the Graves Registration Report Form (above), which you will find is now the official Grave Reference Number on the CWGC website (well, nearly). 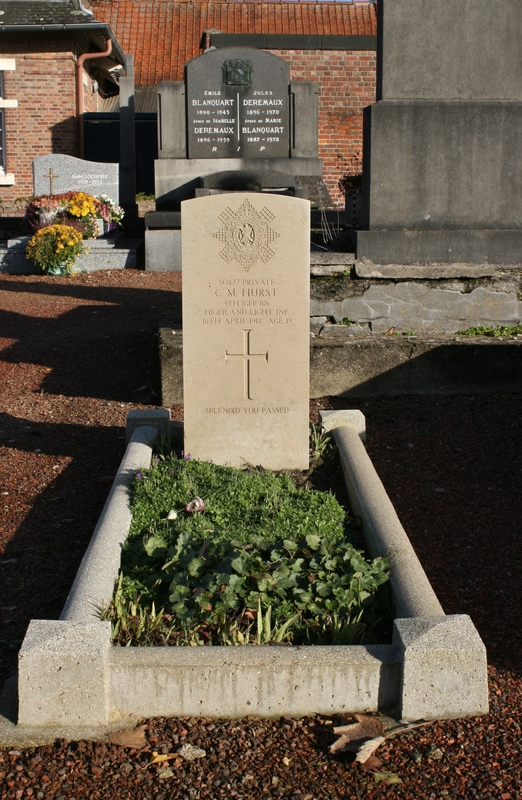 Thank heavens, by the way, that whoever inscribed the headstone spelt ‘chaplain’ correctly, as opposed to the more comical version on the above form! Just so that you can see the date properly. If you take another look at the cemetery plan you will notice that the position of his headstone is incorrectly marked. Either that or it has been moved at some point, which is equally possible. 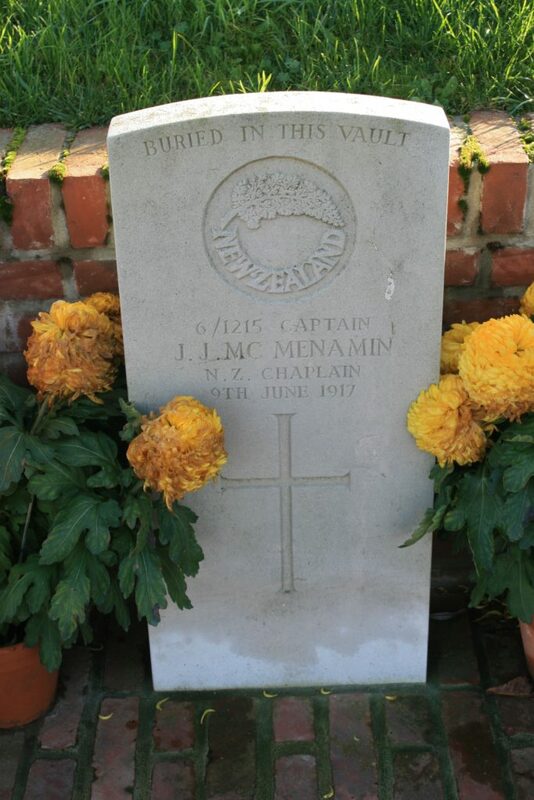 Incidentally, Captain McMenamin is the only man buried here who was killed in action during the Battle of Messines, a battle which has yet to feature in this series of posts, but will do so big-time in the near future. 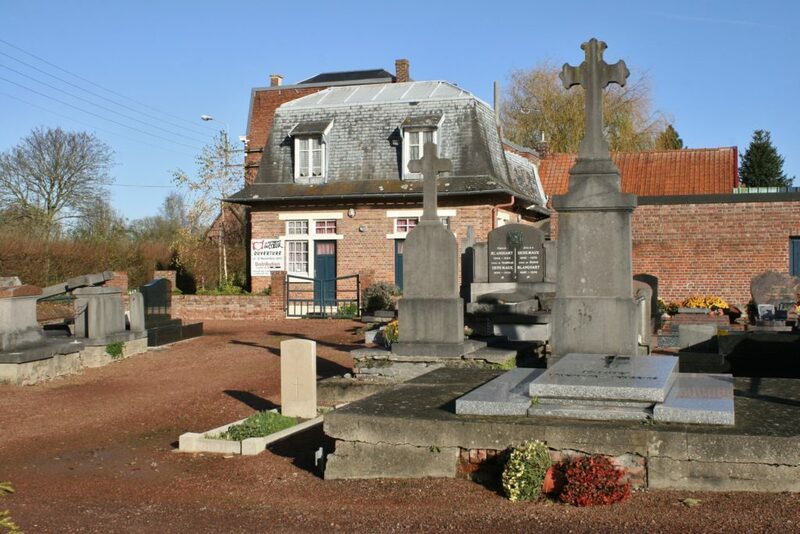 Nieppe, like Pont-de-Nieppe, was occupied by the men of 1st Hampshire Regiment on 16th October 1914, and remained behind British lines until the Germans took the village on 11th April 1918. 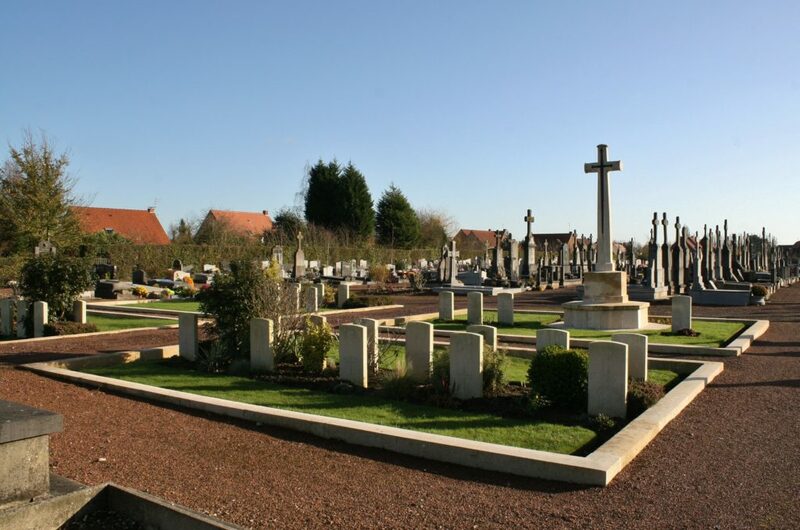 The first British burial in the communal cemetery was made on 15th October 1914, and the last on 7th September 1918, four days after the 29th Division recaptured Nieppe; between that time a further sixty men were buried here, the majority, as we shall see, in 1916 & 1917. The earliest burials are five of the six men in the two groups of three headstones (which make up Plot I) in the above picture, although sixteen months were to pass between the first and the last. Beyond these you can see the single row of headstones in Plot II. 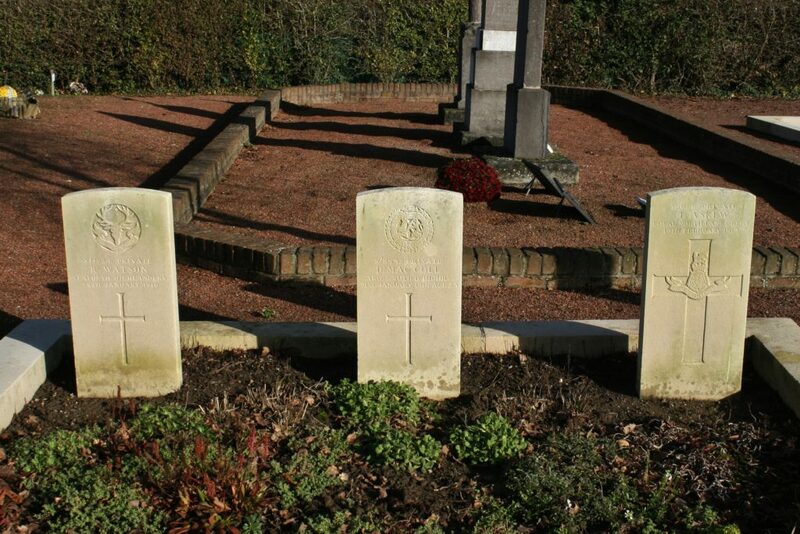 …when these two Royal Field Artillery Drivers, now buried to the right of Private Brown, and presumably killed together on 4th December 1915 (they bear the same Grave Reference Number), were interred here. 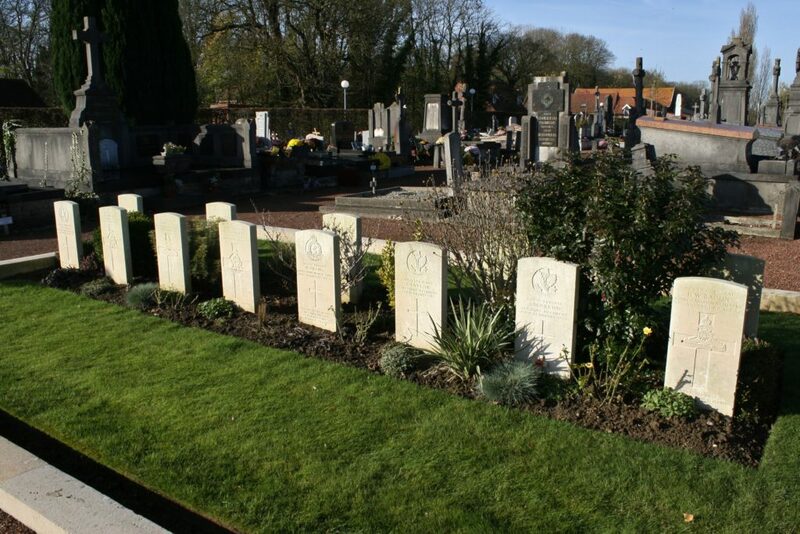 …the fourth and fifth burials in the cemetery, are two Scots, both killed towards the end of January 1916; Private Thomas Askew of the Loyal North Lancashire Regiment, on the far right, is a later burial from February 1917. Plot II. 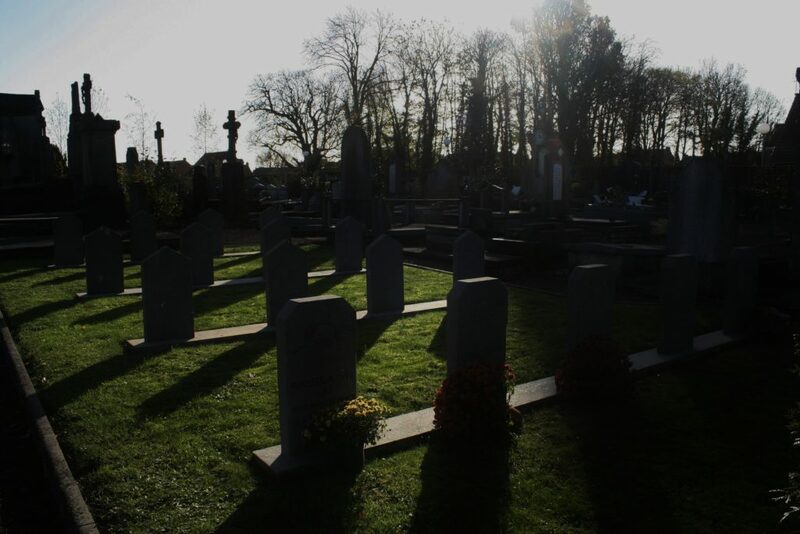 Row A (the only row in the plot) contains mainly burials from 1917, including five of the six Australians buried here. 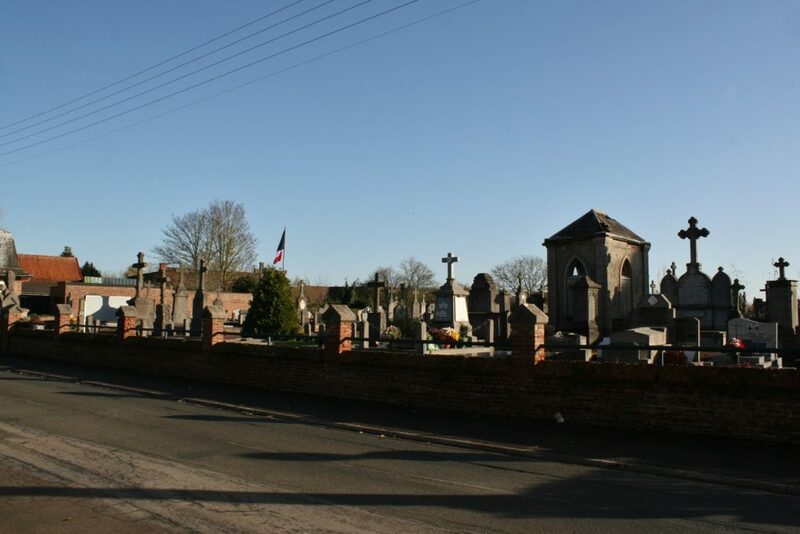 View from behind Plot II Row A, with the two groups of three headstones that comprise Plot I visible in the centre of the picture beyond. The three headstones in Row A nearest the camera are men killed in October 1916, and are the only non-1917 burials in the row. 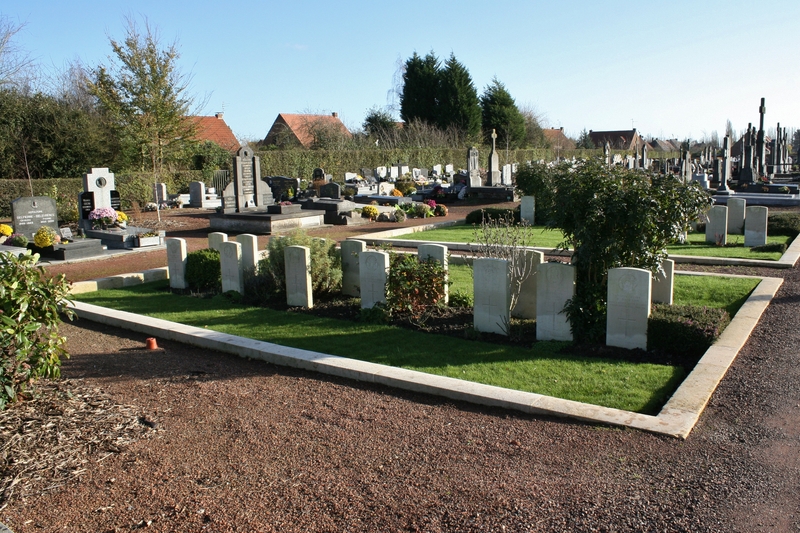 …where seven rows of CWGC headstones, on both sides of the central pathway, make up Plots III to VI. 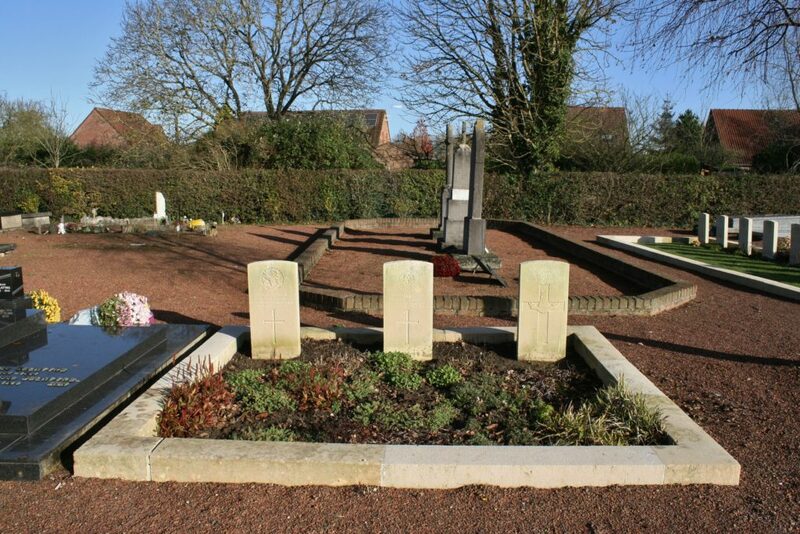 …Plot III Row B, are also all from 1916 except two men killed in July 1917, at this end of the row. 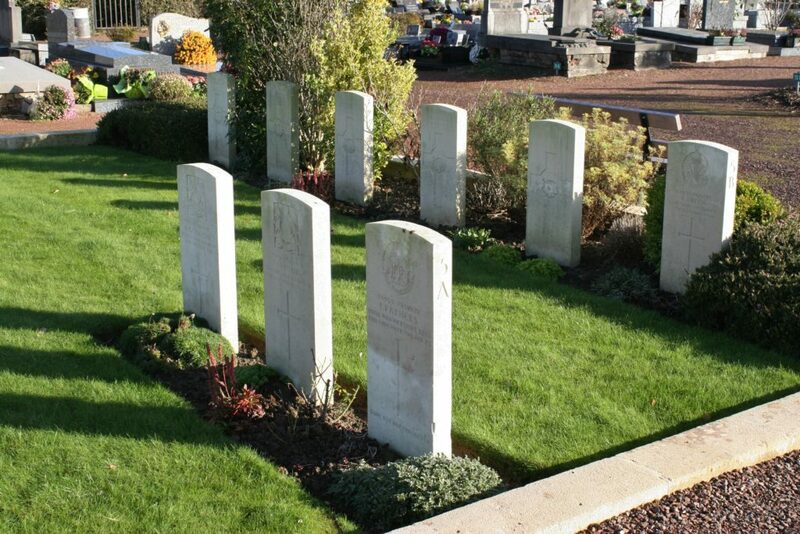 Incidentally, Private D. McMurdie, Argyll & Sutherland Highlanders, third from the left, has an incorrect Grave Reference Number on the CWGC website of Plot III Row D3 (it should, of course, be B3). Plot III Row B again, this time from the other end. 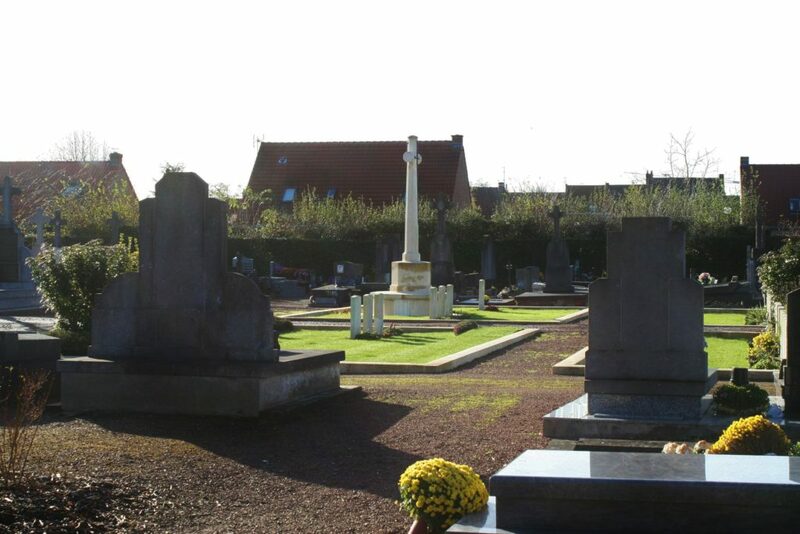 Following the two burials made here in December 1915, twenty men, the majority from a number of different Scottish regiments (six, actually), were buried here between January & May 1916, sixteen between October 1916 & February 1917, and a further twenty in June, July & August 1917; during the months in between the cemetery lay unused. 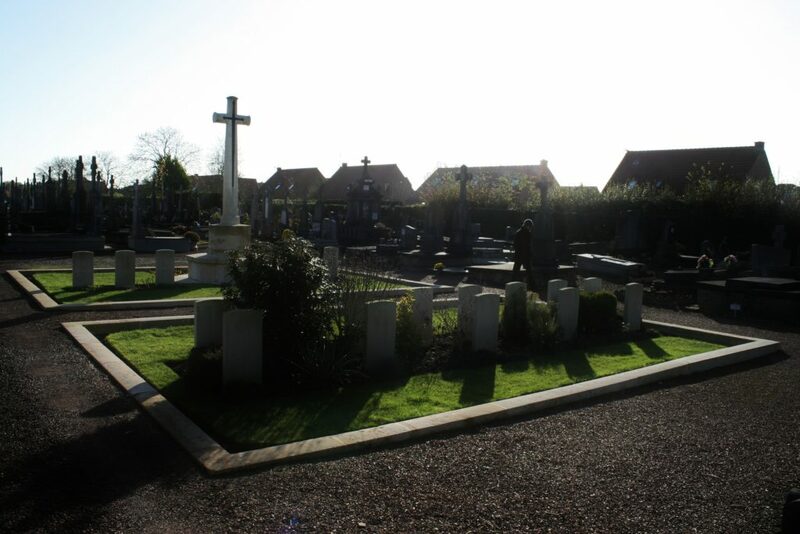 View looking south west across the cemetery, the three headstones of Plot V Row A nearest the camera in the centre (and photo below), and the four headstones of Plot VI Row A just in front of the Cross of Sacrifice. 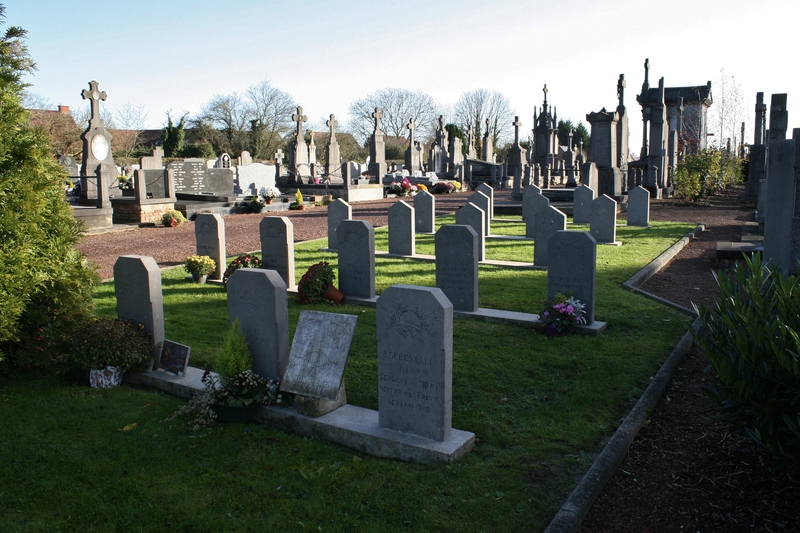 Plot V contains three late 1916 burials in Row A (foreground), and five from the summer of 1917 in Row B behind. The grave of Private E. Green of the Cheshire Regiment, nearest the camera in Row B, and killed on 7th September 1918, is the final British burial in the cemetery. 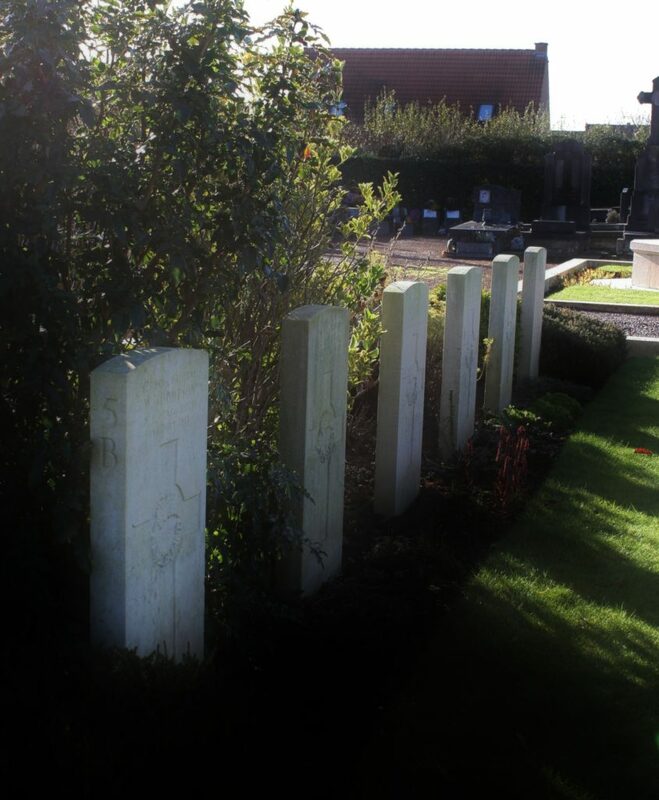 The five other men buried in Plot V Row B are all New Zealanders, of whom there are eleven buried in the cemetery. 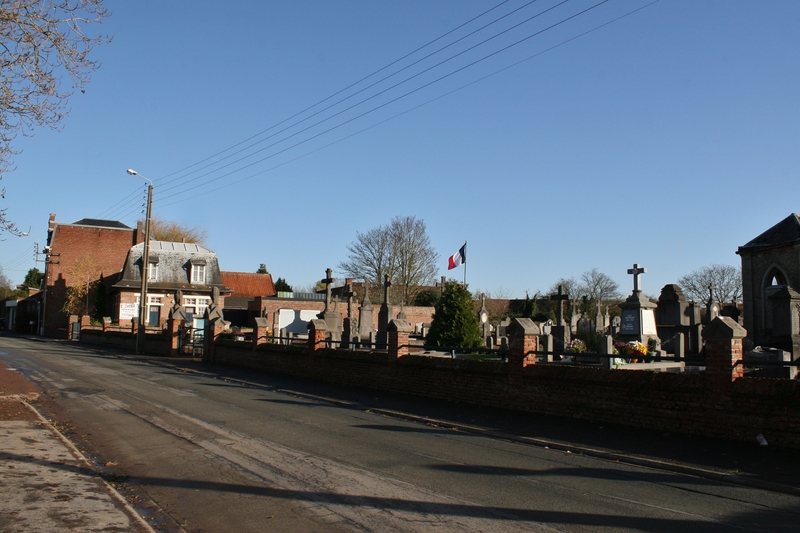 View looking north west, past the Cross of Sacrifice, towards the French cross in the background. If you saw the recent Pont-de-Nieppe post, you will have read about the Divisional Baths that were set up there in 1914, and became famous throughout the British Army in Flanders. Nieppe was also famous in its own right, but not for something that was looked forward to by the troops in quite the same way as a bath and a change of clothes. 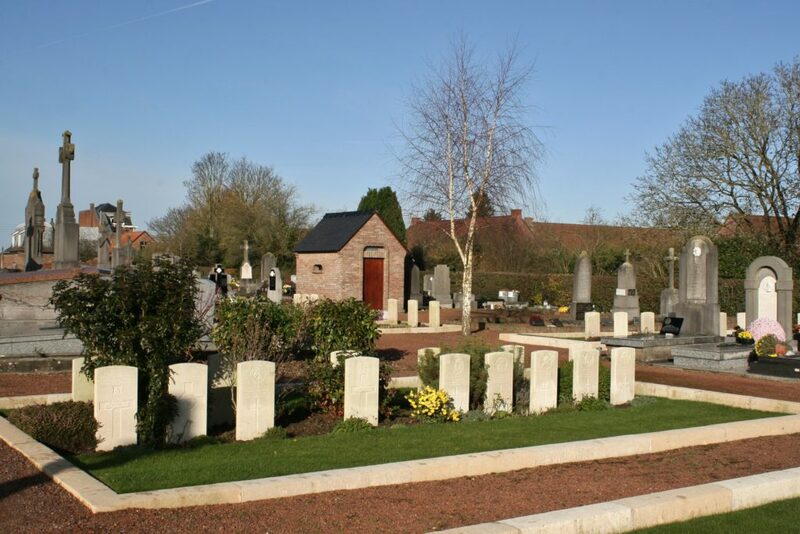 Believe it or not, the Sanitary Sections of the Royal Army Medical Corps worked hard oiling ditches and pools as part of a campaign to prevent the spread of malaria, which was thought to be endemic in the Nieppe area (the notorious fevers of the low countries), and it seems that there were cases, although it could also easily be confused with trench fever, with its recurring febrile symptoms and as yet undiscovered lousy origins, first reported in Flanders in 1915. 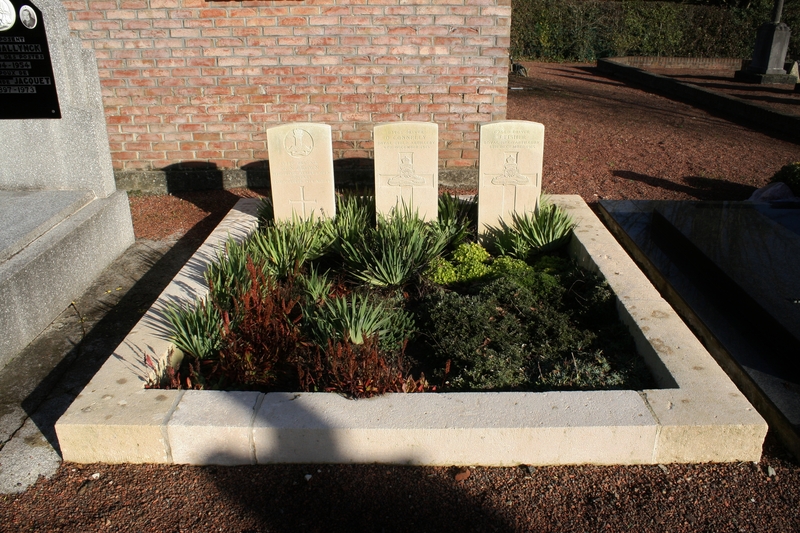 The four headstones on either side of the Cross of Sacrifice comprise Plot VI, the three men on the far side killed over two days in August 1917, the single headstone on the right hand side (on the left in the previous picture) being the sixth Australian buried here, Private C. J. Malone, Australian Pioneers, killed on 17th November 1917, the final burial in 1917. 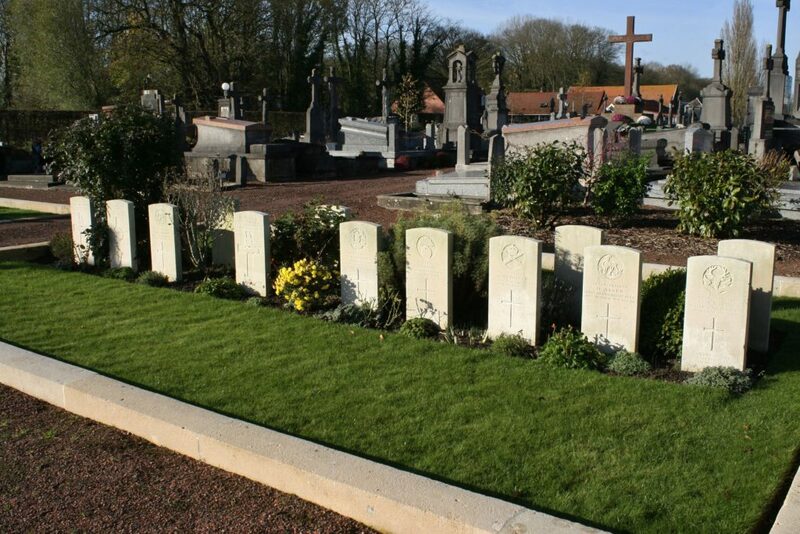 Lastly, this is Plot IV, Row A facing us; these men died in April & May 1916. 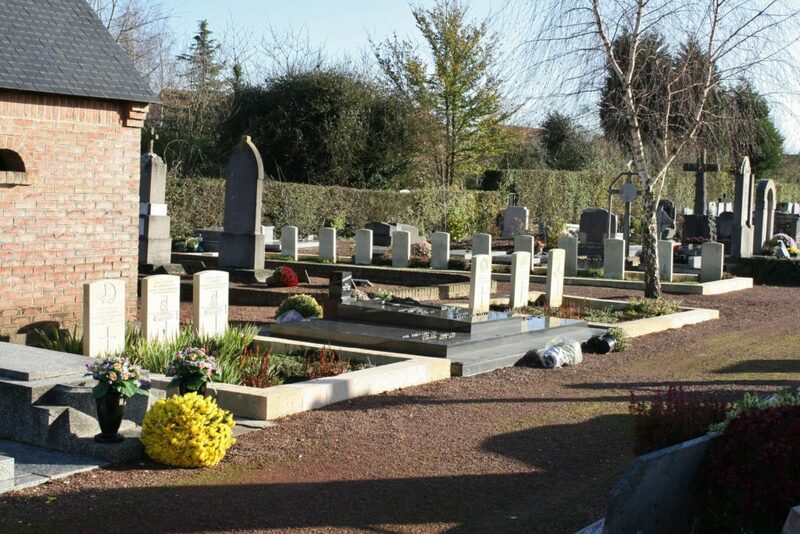 Plot IV Row B. Most of these burials date from between December 1916 & February 1917. 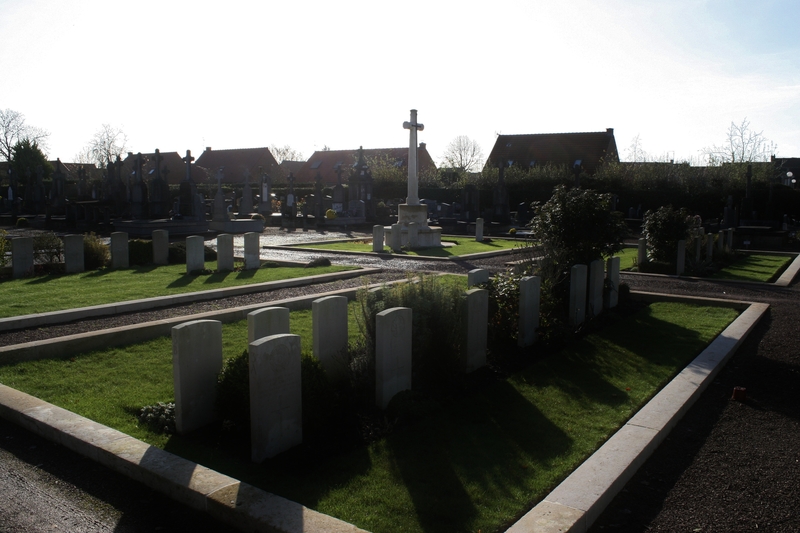 Each of the rows in Plot IV contain a single South African burial, the only ones in the cemetery, both men killed in May 1916. 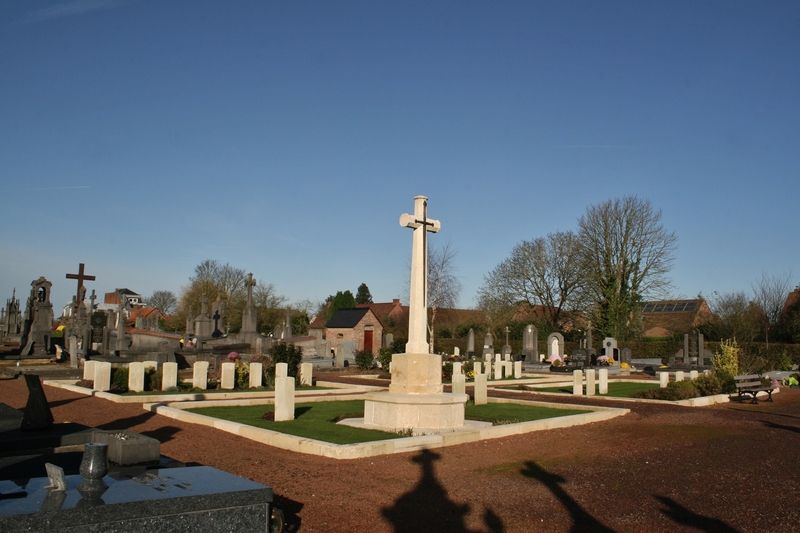 Plot IV in the foreground, the Cross of Sacrifice and Plot VI beyond. 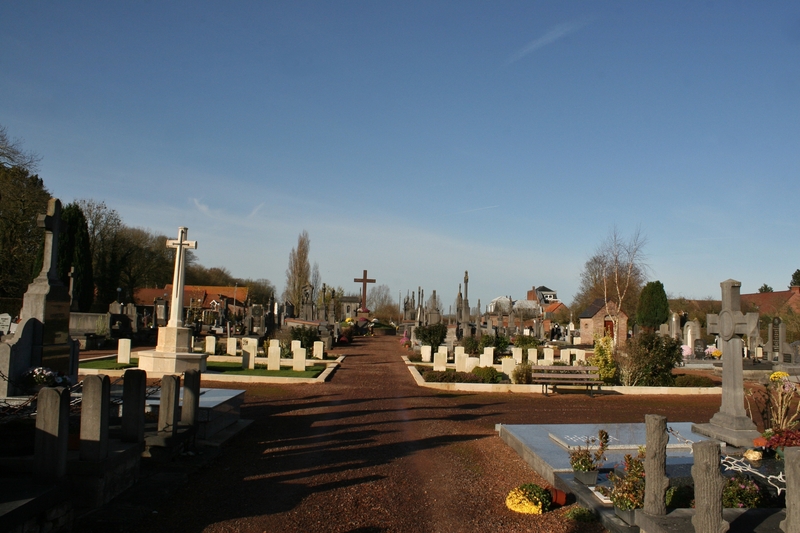 Looking south towards the Cross, Plot IV in the foreground. 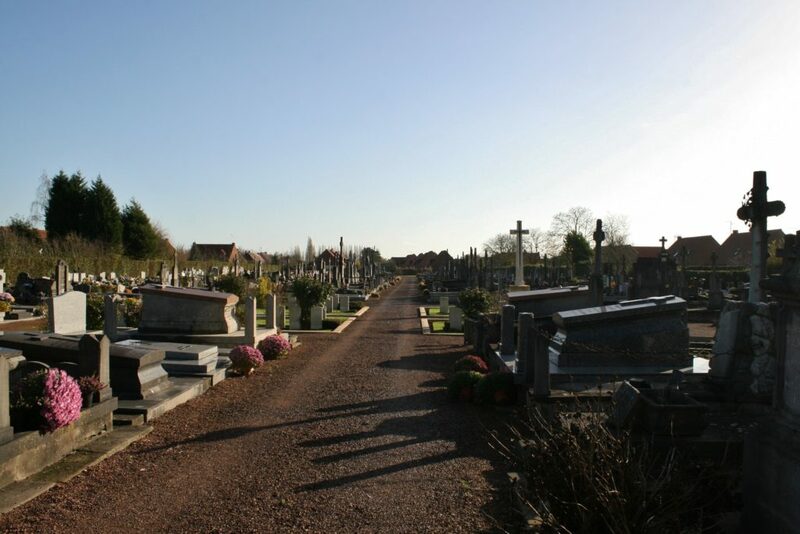 In case you thought I’d forgotten to mention it, there are no unidentified burials in this cemetery. As at Pont-de-Nieppe Communal Cemetery, there is a small plot of French military graves from both World Wars near the cemetery entrance. The road from Nieppe north west to Bailleul, about five and a half miles away, was always a hive of activity, particularly at night. 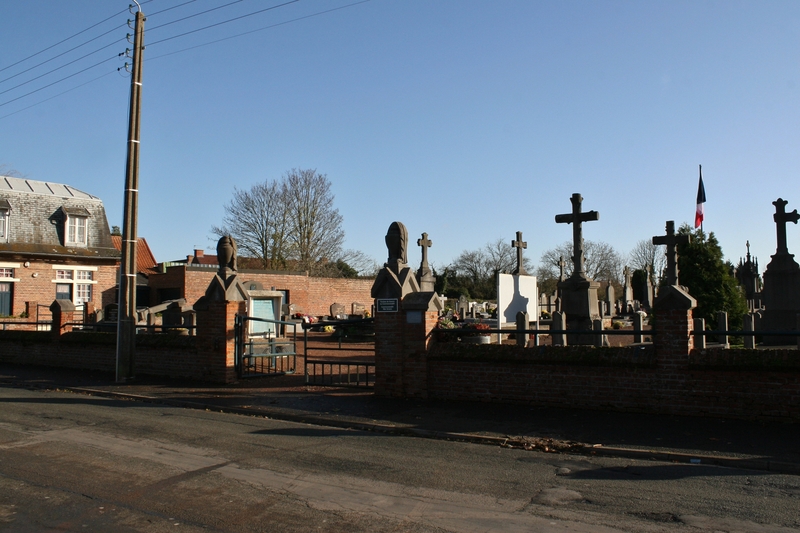 Not only was it a main arterial route for troops moving towards, or away from, the front line, but the Army Service Corps had a number of huge depots just off the road where supplies for the front line troops were organised. 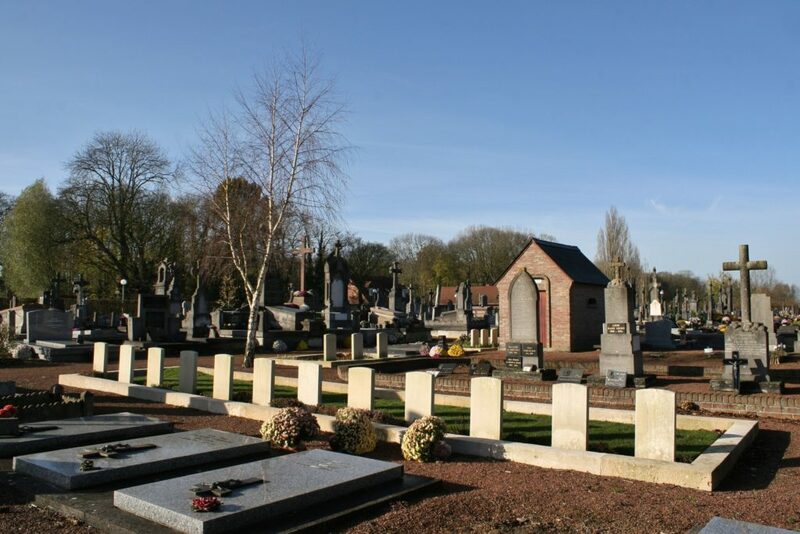 Understandably, the nearer you got to Bailleul and away from the front lines, the more the activity increased, although the whole length of the road was within range of the German artillery, who would have been well aware of much of what was happening due to aerial reconnaissance. Road repair must have been a nightly chore. 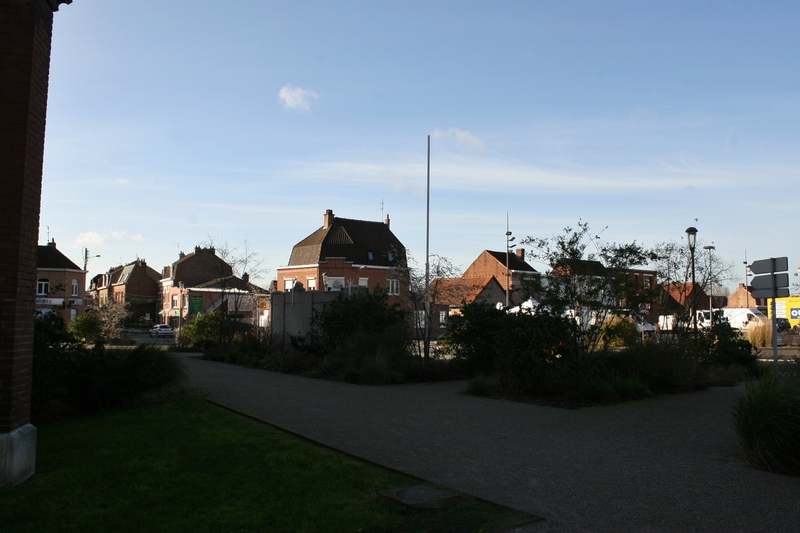 The buildings in Nieppe was used as billets for troops pretty much throughout the war (I see no reason why the Germans would not have used them during the summer of 1918 as well – ready-made billets – the retreating British certainly had no time to do what the Germans did in February 1917 when they withdrew to the Hindenburg Line, so why not?). 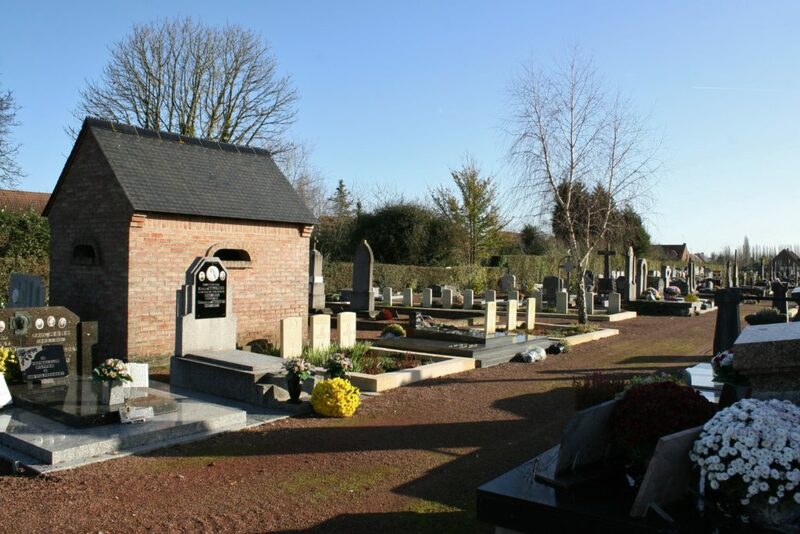 Troops would be billeted here before their stint in the front line, or when involved in the daily training that took place for troops out of the line; men who would form the nightly working parties would also rest up in Nieppe during the day before heading up to the trenches at dark. Training would take place each morning around the village, and from what I can gather, the afternoons were generally given over to sports, inter-platoon rugby matches and inter-company football matches being played on ‘very rough ground’ somewhere nearby. Brigade boxing matches were also common, the whole brigade being marched to the village to support their champions. All, let’s not forget, well within the range of German artillery. 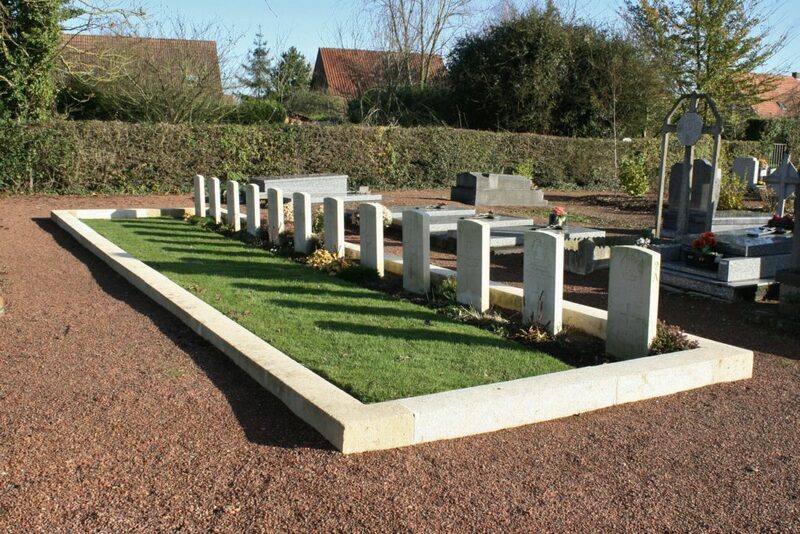 The two rows nearest the camera in this French military plot are Second World War graves, and you will notice that they are shaped differently to the First World War ones. Whether the Germans used this cemetery during their occupancy of this area during the summer of 1918 I know not but, as you may have spotted on the earlier Grave Registration Report, the British buried at least two Germans here. 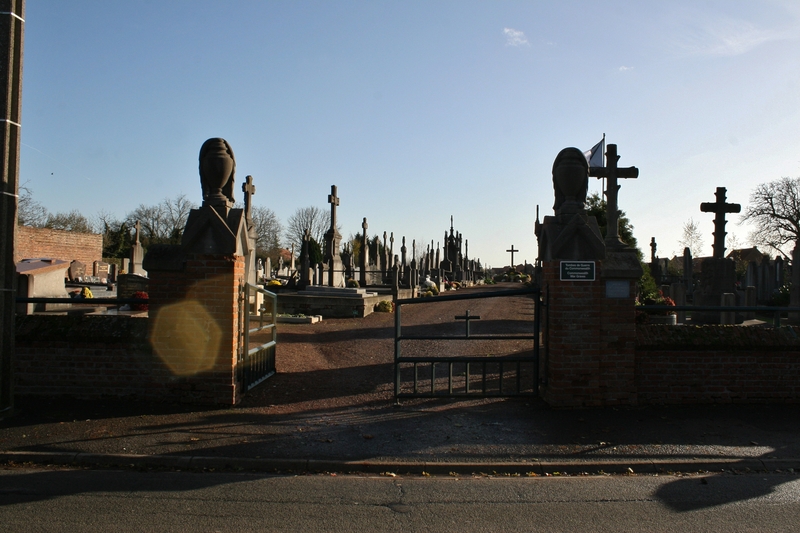 However many there were, they were moved to, almost certainly, the German cemetery at Pont-de-Nieppe after the war. 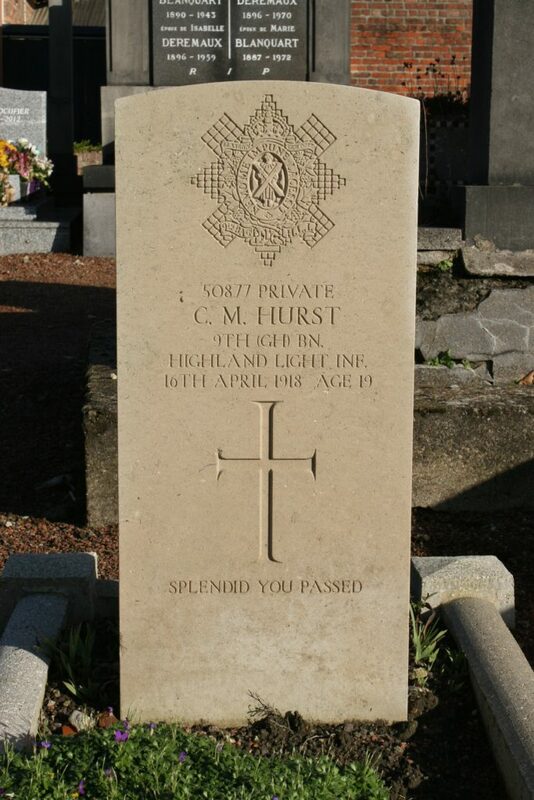 And so we find ourselves back at the grave of Private Hurst, the second man mentioned by name on the Cemetery Plan (his Grave Reference Number is given as ‘On N. side of centre path.’), whose headstone is inscribed with my favourite family inscription among the thousands and thousands of headstones I have read. The words come from a poem by Sir John Stanhope Arkwright, published in 1919 in an anthology entitled ‘The Supreme Sacrifice, and other Poems in Time of War’, and better known today as the hymn ‘O Valiant Hearts’. 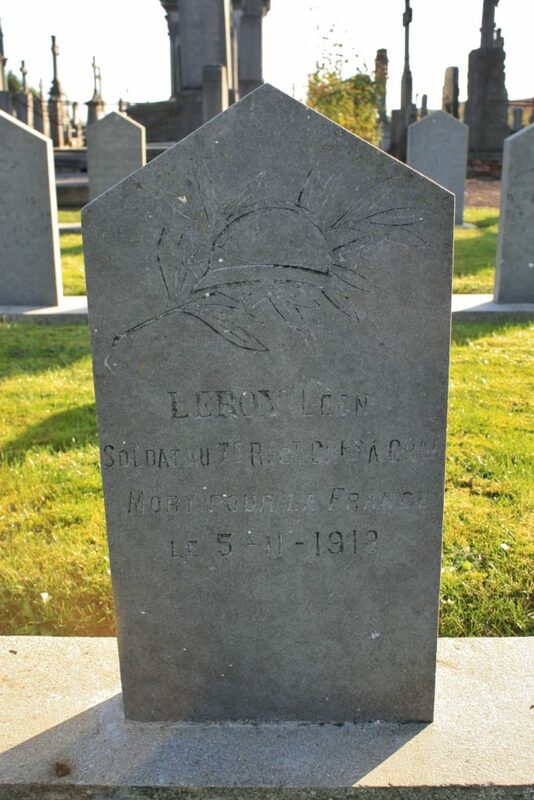 While we are on the subject of headstone inscriptions, my favourite one Back in Blighty (non-military, but still brilliant) can be found half way through the post you will find yourself at if you click here. Right, time to move on. 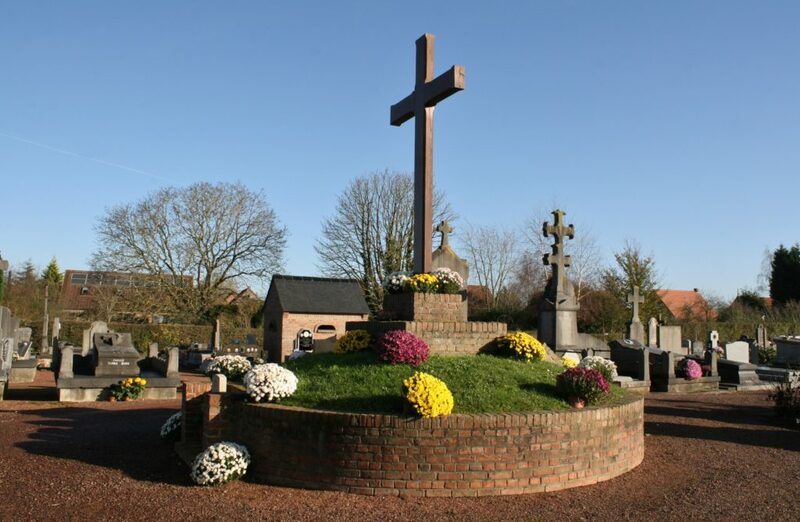 …we ought to pay our respects at the village war memorial, a teasing glimpse of which you can see here as we peer round the buttress of Nieppe church. This entry was posted in Armentières to Steenwerck, French Flanders. Bookmark the permalink. Thank you Sid. Some fascinating stuff (well, I think so!) 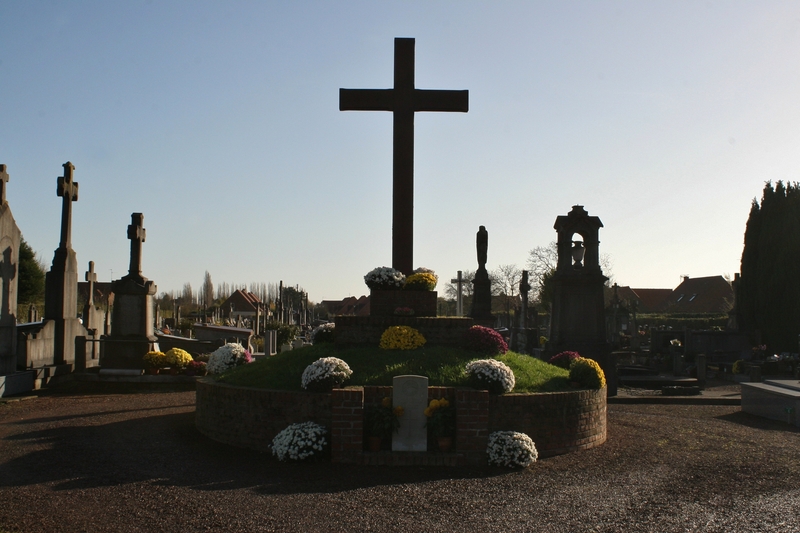 coming up soon about the ANZAC medical services in this area, specifically with regard to Messines. I think you will enjoy it. 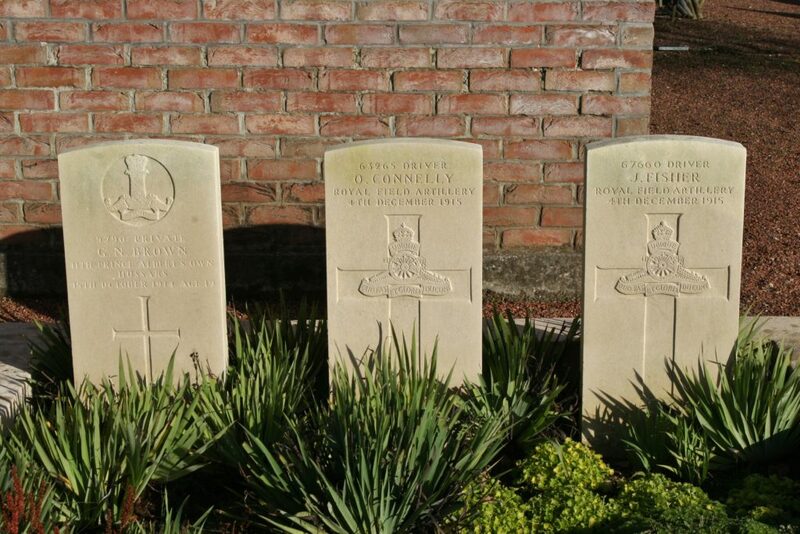 As I said in my other reply to you, the Hunter brothers story, or at least the excavation of the Zonnebeke Five, had other surprises in store. How cryptic I am. Right, it’s nearly Superbowl time and I have a long night ahead of me! Good job I’ve got tomorrow off work. 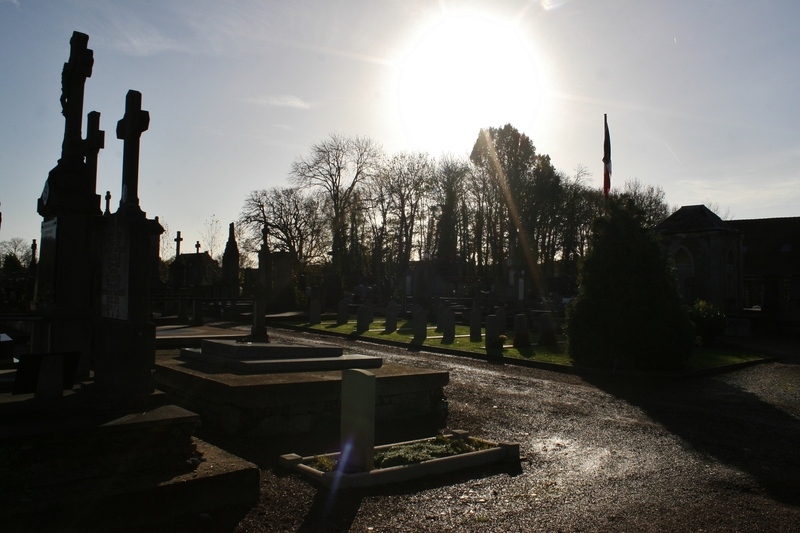 You may be interested in this article I wrote that includes how Fr McMenamin ended up buried in the priest’s vault. Elizabeth, thank you very much for commenting, and for the links. Fascinating. I am going to add a mention of them in my text. Seeing the old photo confirms that the position on the cemetery plan of Fr McMenamin’s headstone is definitely incorrect – you can see British crosses in the background of the photo.